Dental veneer (so-called porcelain veneers or dental porcelain laminates) is thin porcelain of tooth-colored materials designed to replace the front surface of teeth to improve patient appearance. These porcelain are bonded to the front of the teeth in order to change patient color, shape, size or alignment. 1. Patients can select color and white shade of porcelain veneers and their new smile. 2. Dental veneers provide natural teeth appearance. 3. Porcelain veneers are stain resistant from any patient behaviors like smoking, coffee, drug. 5. Veneer offers conservative approach to change color, shape and alignment of patient teeth. After perform veneers, patient have improvement of smile and teeth alignment.In some case, veneers will also fix color problems. 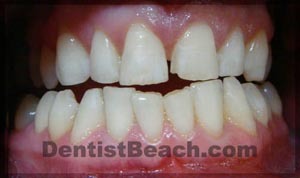 Dentist @ Beach typically use porcelains and materials to make a veneer from IPS Empress Esthetic system. The system has been used in market over decades and are standardized in dentistry in Europe or USA. Empress veneer costs 8000 to 12000 Thai Baht per veneer (tooth). 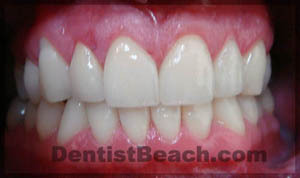 For smile makeover case, patients need 6-8 veneers to improve new smile like below case. Our dentist make four veneers on upper teeth and two veneers on lower teeth. You can view more sample veneer cases by this case gallery link. Diagnosis and treatment plan are the first step involving discussion between patients and dentists. Dentists will explain the expected results of the final works. During this appointment your dentist will examine your teeth to make sure dental veneers are appropriate for you and discuss about working procedures, time-frame, limitation and costs. Dentist will take xray and take your teeth impression for study the case. To prepare a tooth for veneers, dentists will remove about 1-2 mm of enamel surface, which is an amount nearly equal to the thickness of the veneer to be added to the tooth surface. Before trimming off the enamel, you and your dentist will decide the need for a local anesthetic to numb the area. Then, dentist will make a model or impression of your tooth. This model is sent out to a dental laboratory, which in turn constructs your veneer. It usually takes around 4-6 days for your dentist to receive the veneers back from the laboratory. In this visit, temporary dental veneers will be made. So, you will have no problems for smiling and eating while waiting for permanent veneers from laboratory in a week later. In this time, patient can leave Pattaya and come back again once the veneers in done. Before place veneers to patient teeth to receive the veneer, dentist will perform cleaning and polishing and etching which roughens the tooth to allow for a strong bonding process. A special cement is applied to the veneer and the veneer is then placed on your tooth. Once properly position on the tooth, your dentist will apply a special light beam to the dental veneer, which activates chemicals in the cement causing it to harden or cure very quickly. Then, dentist will removing any excess cement, evaluating patient bite and make adjustments in the veneer if necessary. In some case, dentist will ask a follow-up visit in for post check up such as gum responding to the presence of new veneer or examine the veneer placement before leave Pattaya.